VivifyScrum is a web-based agile project management solution that allows users to plan, organize, manage and finish projects in one place using Scrum and Kanban collaboration boards. The platform offers management features to suit the needs of small agile teams, as well as large organizations alike, including time management, invoicing, client base, team engagements, project calendar, reports, and more. Within VivifyScrum, users can create a Project which provides an overview of all team members included in the project, their engagements on it, as well as connected boards and clients. Collaboration boards help streamline workflows, and the types used can be selected depending on specific needs. Users can set up a customizable Scrum board, or a more simple Kanban board to collaborate on projects with the team. Scrum boards include a product backlog, sprints, and burndown charts, while Kanban boards visually show how tasks move through columns from left to right, each representing a stage of the overall process. Tools for team management enable users to get insight into each member’s availability, keep track of their workload, as well as assign their permissions, roles and engagements. The time tracking feature automatically logs the hours worked on a selected task, which can be paused, edited, or added to for any selected item. Users can create invoices that match their business requirements and branding, as well as manage clients, send invoices and track payments all within VivifyScrum. In trying to find solutions for my clients who rely on Scrum, I discovered VivifyScrum and decided to take it for a test-drive. I am truly impressed with its true Scrum approach without trying too hard to be something else. It is functional and truly effective and has all that one needs to keep a Scrum team on track. It handles all aspects of development, including bugs and testing, something some simpler applications cannot accommodate.VivifyScrum is built with Scrum at its foundation. It allows you to select from a Kanban or Scrum view as well. It's default settings reflects its Scrum roots with columns for Backlog, To Do, In Progress and Done. Need to customize it a bit? You can add more columns as needed. It employs estimations for stories and provides a host of functions for each card: commenting, file attachments, priorities, sub-items (tasks), lists, events, tags and more. Everything to keep a project running on Scrum efficiently. VivifyScrum also provides all the Scrum artifacts including burndown charts and velocity. Need to control how the teams have access? this is also managed, with various accessibility levels that reflect true Scrum ownership in projects. Planning poker is even included. 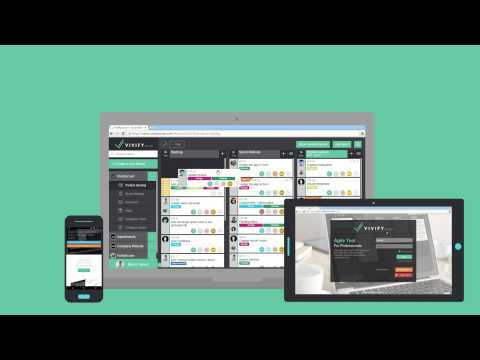 VivifyScrum has just the right balance of customization features without overdoing it. Everything you need to run Scrum is there. Or, at least, the majority. Maintaining Product's backlog was an over head earlier, and managing the human resource velocity for each Project was real problem earlier, Now it seems so easy.Vivifyscrum is an excellent user friendly and very intuitive agile project management tool. Featuers which I liked most in this software is the User Interface layout which is very easy for any new bie to get started in no time. My team uses drag and drop feature to move the items from BackLog to sprint Backlog and mark them "In Progress" to "Done" so quickly. Planning sprint looks so easy using this software. The over head of updating the worklog reporting time is almost zero because of user friendly interface which makes my team happily use this software, compared to other tools which were an over head. Graphical representation of team's utilisation provides a complete productivity in pictorial format which is great feature to look at the end of sprint. Vivifyscrum is an excellent user friendly and very intuitive agile project management tool. Featuers which I liked most in this software is the User Interface layout which is very easy for any new bie to get started in no time. My team uses drag and drop feature to move the items from BackLog to sprint Backlog and mark them "In Progress" to "Done" so quickly. Planning sprint looks so easy using this software. The over head of updating the worklog reporting time is almost zero because of user friendly interface which makes my team happily use this software, compared to other tools which were an over head. Graphical representation of team's utilisation provides a complete productivity in pictorial format which is great feature to look at the end of sprint. Vivify Scrum is truly useful for small businesses when taking advantage of the operational and financial aspects of the businesses. With invoicing integrated, its use in larger organizations might not be inline with the common separation of operations and finance that is typically found in the enterprise environment. But this is great for the smaller businesses. This integration is also effective in minimizing the number of applications in use. Simply track projects, time and invoice from one single solution.Vivify Scrum offers Agile project management for small businesses at an affordable rate. It combines the project management functionality that fits any business, especially small businesses, with financial and reporting tools that are often a separate entity of software management tools. The integration offered by Vivify Scrum, with the affordability aspect, makes this a great solution for small businesses. Vivify Scrum provides flexibility in how you wish to run your Agile process: Scrum or Kanban. The product tracks time and progress, allowing businesses to invoice their clients effortlessly. And as part of the project tracking and invoicing, you have time management capabilities included. Vivify Scrum offers a 14 day free trial. YOu can use its project management features for free, or upgrade to the use the time management, time tacking and invoice features. Vivify Scrum offers Agile project management for small businesses at an affordable rate. It combines the project management functionality that fits any business, especially small businesses, with financial and reporting tools that are often a separate entity of software management tools. The integration offered by Vivify Scrum, with the affordability aspect, makes this a great solution for small businesses. Vivify Scrum provides flexibility in how you wish to run your Agile process: Scrum or Kanban. The product tracks time and progress, allowing businesses to invoice their clients effortlessly. And as part of the project tracking and invoicing, you have time management capabilities included. Vivify Scrum offers a 14 day free trial. YOu can use its project management features for free, or upgrade to the use the time management, time tacking and invoice features. Vivify Scrum wasn't my first choice, but my colleague strongly suggested to use it. When I adopted i started to really like it and use it in my other projects. It is intuitive, visual, and easy to use. It gives you all the information about the project, team, tasks... Time tracker is also a great addition. And since we charge hourly, it is pretty cool that you can create an invoice based on your time recorded from time tracker. The premium plan is very affordable considering all the features. It is well organized, and gives you a nice and clear view on your tasks and your team members activity. There are some cool features. Premium plan ($8 per user per month) unlocks additional VivifyScrum features and possibilities. Make workflows and processes more efficient using VivifyScrum's tools for project tracking and team management. VivifyScrum covers all aspects of a business - from managing projects, collaboration, team management to invoicing. Customize project Scrum and Kanban boards and access them via web, desktop or VivifyScrum's iOS app. Get a visualization of every team members’ engagements via the project calendar, which is generated automatically as engagements are added to VivifyScrum. Provide more details on an item by uploading and attaching relevant files using drag and drop. Quickly search through and manage files within the 'Files' page via the sidebar. Below are some frequently asked questions for VivifyScrum. Q. What type of pricing plans does VivifyScrum offer? Q. Who are the typical users of VivifyScrum? Q. What languages does VivifyScrum support? Q. Does VivifyScrum support mobile devices? Q. Does VivifyScrum offer an API? Yes, VivifyScrum has an API available for use. Q. What other apps does VivifyScrum integrate with? Q. What level of support does VivifyScrum offer?